The term “Amish Furniture” brings to mind fine craftsmanship and heirloom quality, but not all Amish furniture is the same. At Herron’s, we have been forging relationships with our Amish builders for more than 20 years- choosing only the cream of the crop, the best of the best, to sell to our customers. The Chelsea Bed is just one example of hundreds of bedroom options available. 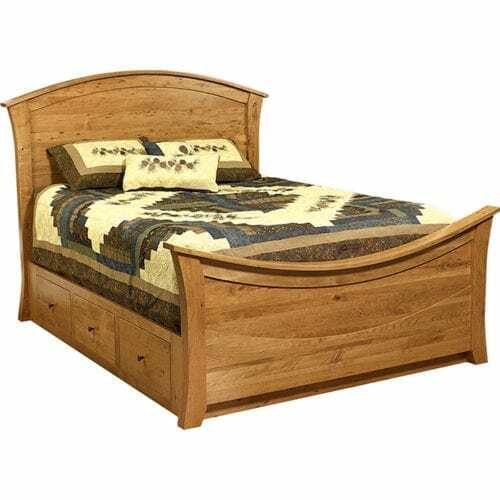 All our Amish-made bedroom pieces are heirloom-quality and are produced by highly skilled craftsman. They are available in a variety of styles and timeless designs that match any decor. Solid wood, metal L-brackets, and dove tailed slats give our beds rock solid constructions. You say you’d like a low foot board, or none at all? We can do that for you! Plus you can even add under bed storage or an adjustable motion base to go with it. When combined with one of our most comfortable and durable mattresses, you’re ready for a great night’s sleep. The Duchess Sleigh Bed is just one example of hundreds of bedroom options available. All our Amish-made bedroom pieces are heirloom-quality and are produced by highly skilled craftsman. They are available in a variety of styles and timeless designs that match any decor. Solid wood, metal L-brackets, and dove tailed slats give our beds rock solid constructions. You say you’d like a low foot board, or none at all? We can do that for you! Plus you can even add under bed storage or an adjustable motion base to go with it. When combined with one of our most comfortable and durable mattresses, you’re ready for a great night’s sleep. The term “Amish Furniture” brings to mind fine craftsmanship and heirloom quality, but not all Amish furniture is the same. At Herron’s, we have been forging relationships with our Amish builders for more than 20 years- choosing only the cream of the crop, the best of the best, to sell to our customers. The Stone Creek Storage Bed is just one example of hundreds of bedroom options available. 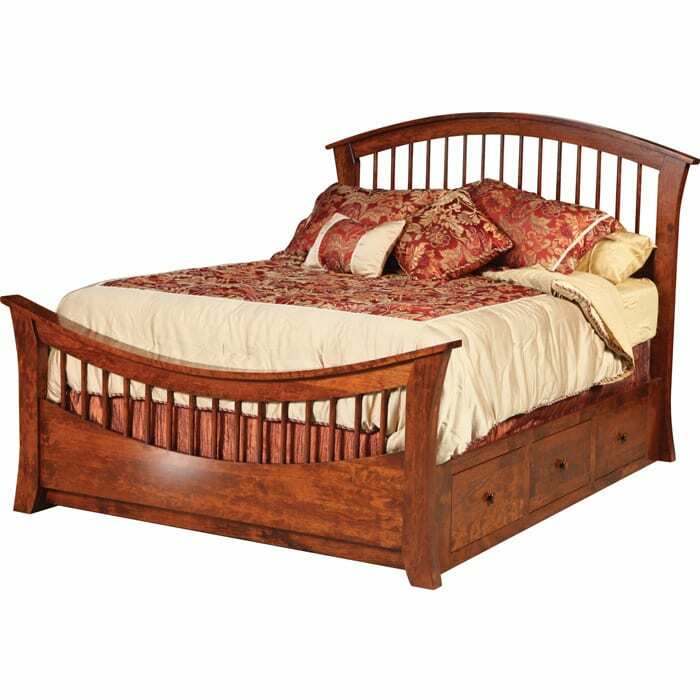 All our Amish-made bedroom pieces are heirloom-quality and are produced by highly skilled craftsman. They are available in a variety of styles and timeless designs that match any decor. Solid wood, metal L-brackets, and dove tailed slats give our beds rock solid constructions. You say you’d like a low foot board, or none at all? We can do that for you! Plus you can even add under bed storage or an adjustable motion base to go with it. When combined with one of our most comfortable and durable mattresses, you’re ready for a great night’s sleep. The term “Amish Furniture” brings to mind fine craftsmanship and heirloom quality, but not all Amish furniture is the same. At Herron’s, we have been forging relationships with our Amish builders for more than 20 years- choosing only the cream of the crop, the best of the best, to sell to our customers. The Mission Economy Panel Bed is just one example of hundreds of bedroom options available. All our Amish-made bedroom pieces are heirloom-quality and are produced by highly skilled craftsman. They are available in a variety of styles and timeless designs that match any decor. Solid wood, metal L-brackets, and dove tailed slats give our beds rock solid constructions. You say you’d like a low foot board, or none at all? We can do that for you! Plus you can even add under bed storage or an adjustable motion base to go with it. When combined with one of our most comfortable and durable mattresses, you’re ready for a great night’s sleep. The term “Amish Furniture” brings to mind fine craftsmanship and heirloom quality, but not all Amish furniture is the same. At Herron’s, we have been forging relationships with our Amish builders for more than 20 years- choosing only the cream of the crop, the best of the best, to sell to our customers. The Woodbury Bed is just one example of hundreds of bedroom options available. All our Amish-made bedroom pieces are heirloom-quality and are produced by highly skilled craftsman. They are available in a variety of styles and timeless designs that match any decor. Solid wood, metal L-brackets, and dove tailed slats give our beds rock solid constructions. You say you’d like a low foot board, or none at all? We can do that for you! Plus you can even add under bed storage or an adjustable motion base to go with it. When combined with one of our most comfortable and durable mattresses, you’re ready for a great night’s sleep. The term “Amish Furniture” brings to mind fine craftsmanship and heirloom quality, but not all Amish furniture is the same. At Herron’s, we have been forging relationships with our Amish builders for more than 20 years- choosing only the cream of the crop, the best of the best, to sell to our customers. The Rainbow Storage Bed is just one example of hundreds of bedroom options available. All our Amish-made bedroom pieces are heirloom-quality and are produced by highly skilled craftsman. They are available in a variety of styles and timeless designs that match any decor. Solid wood, metal L-brackets, and dove tailed slats give our beds rock solid constructions. You say you’d like a low foot board, or none at all? We can do that for you! Plus you can even add under bed storage or an adjustable motion base to go with it. When combined with one of our most comfortable and durable mattresses, you’re ready for a great night’s sleep.